7.5" white indoor wall decorative polyresin hand painted elephant head wall hanger one hook. This product is completely made by hand and quality is strictly checked through every production process from beginning to finishing: figurine sculpture, making mould, shaping, polishing, painting, accessory assembling, and finally quality inspection before packed in box. 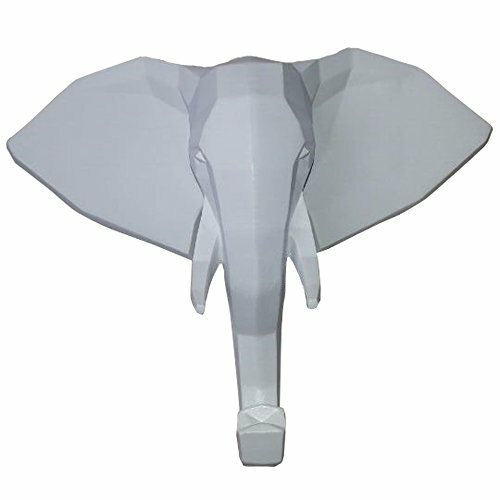 Elephant head wall hanger single hook in white color - decorative hanging clothes rail set - easy to mount on wall - great addition to your home, office, store and anywhere needed - it is lightweight and done in nice detail. Material: 100% polyresin hand crafted and painted. 2016 newly released collection-suitable gift for animal lovers and wall dÃcor collectors-more animal head design hanger can be found in COMFY HOUR store. If you have any questions about this product by Comfy Hour, contact us by completing and submitting the form below. If you are looking for a specif part number, please include it with your message.